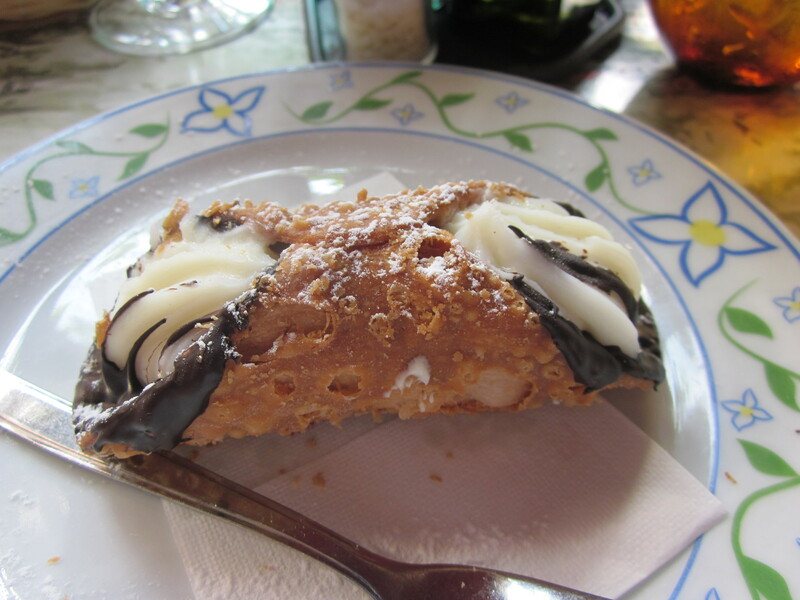 Before we left, I had several friends to INSIST that we eat canoli while we were gone. Here is proof that we did just that. 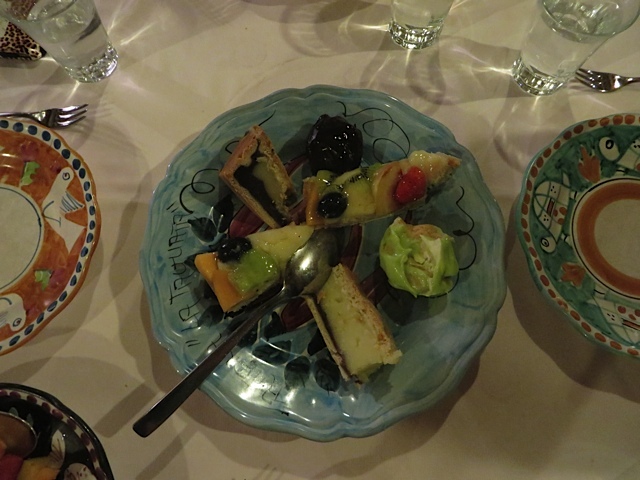 We ordered it for dessert at a delightful restaurant in Positano. 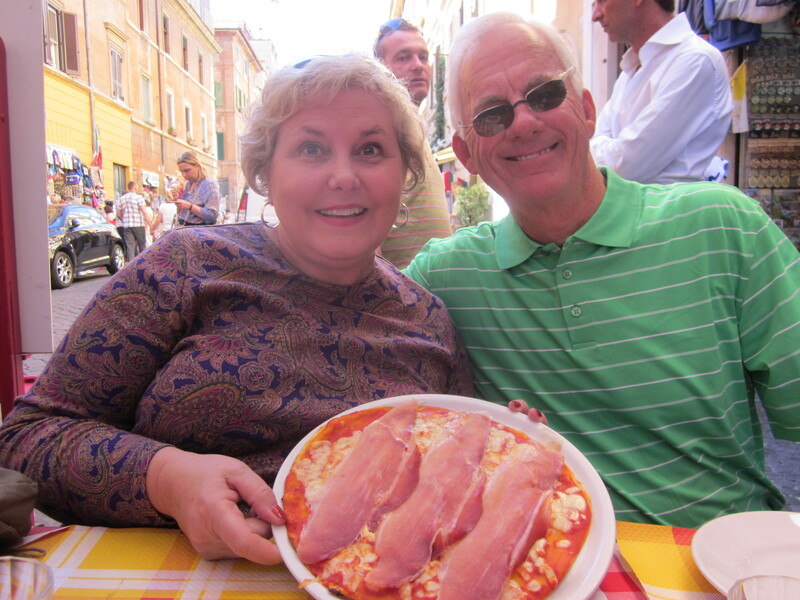 So, to be very concise, the food in Italy was amazing. We didn’t eat a single “bad meal” the whole time we were gone. Trust me on that. When we returned, I friend who went to Italy last year told me that he “didn’t really care for gelato” and actually “had rather have Papa John’s.” Are you serious??? I would have to first of all ask, “Then, where in the world did you eat?” Also, would you believe that we didn’t gain weight while we were gone?? I attribute that to 2 things: 1) Lots of walking, and 2) Eating dishes with fresh ingredients and virtually no processed foods. Gelato, also, is less heavy than the ice creams we have here in the States. And, I finally concluded that my two favorite flavors were stracciatella (similar to chocolate chip) and bacio (a combination of chocolate and hazelnut). 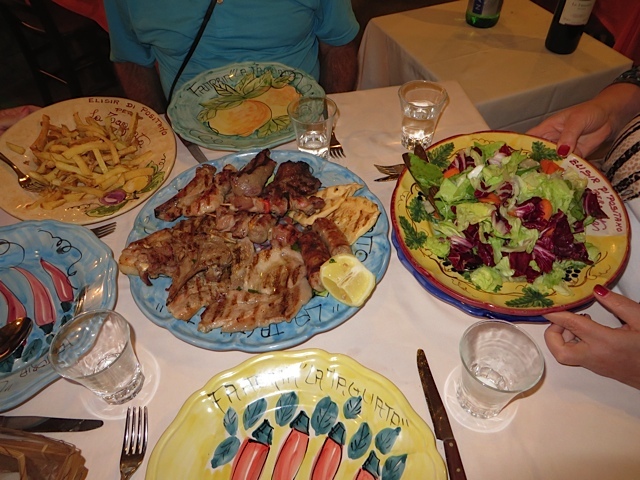 Restaurants (ristorantes and trattorias) have one annoying habit to which we had to adjust. They charge for the basket of bread and add a cover charge for each person at the table. It’s called a “coperto.” We never did figure out for sure if a tip was expected on top of that. Sometimes we left one. Other times we did not. 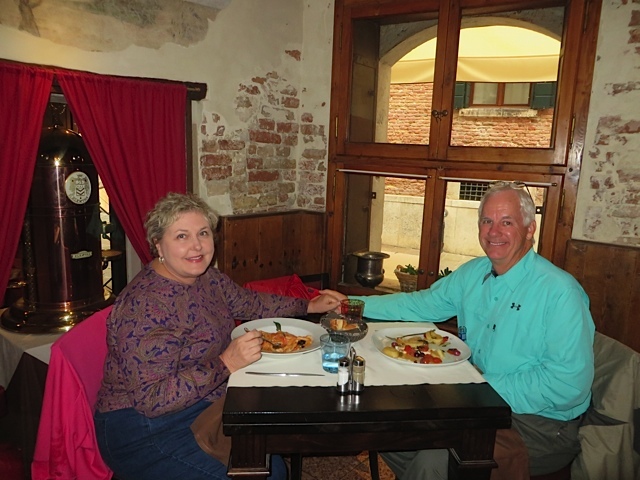 If I had to narrow down the approximately 42 meals that we consumed while we were in Italy to just five, I believe the following would be my Top Five. 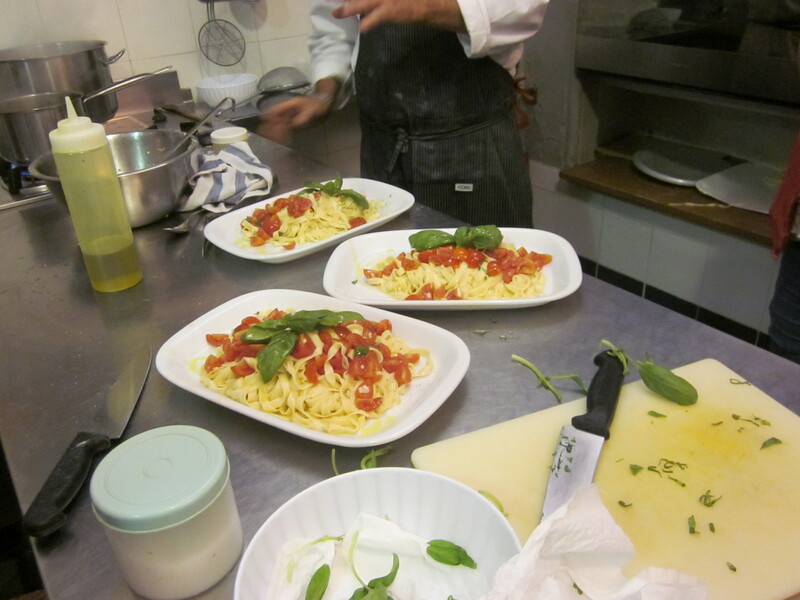 1) Trattoria La Tagliata, overlooking the town of Positano on the Mediterranean. What an amazing experience!!! The first course. Yes, that’s right, the FIRST course. 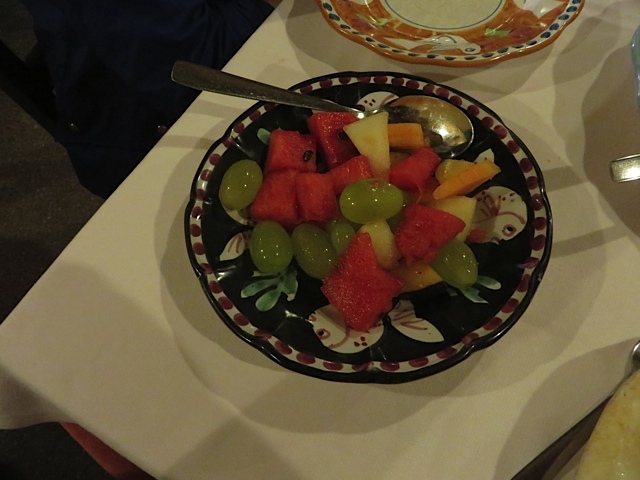 The waiters brought out about eight vegetables that had been grown right on the premises. 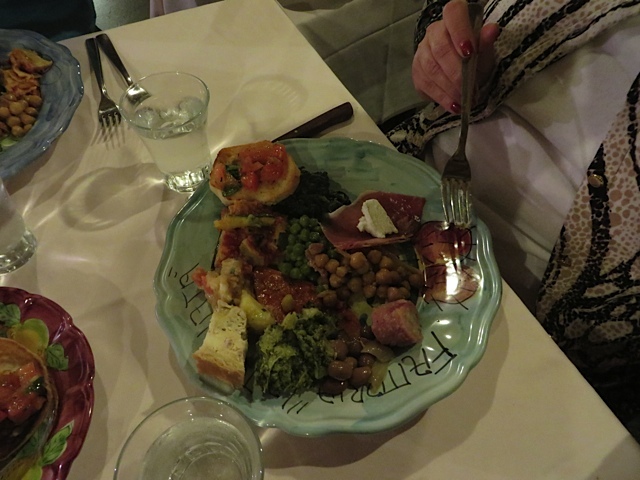 You can also see an appetizer of crostini on the side. The second course consisted of three kinds of pasta. I don’t have a good picture of that, but believe me, it was delicious. Next came the meat course, accompanied by potatoes and salad. The meats were beef, chicken, veal, lamb, pork and sausages. Don’t you love the colorful dishes?? And, just when we thought we couldn’t possibly hold anything else, here came the plate of pastries and a bowl of fresh fruits. I’m telling you. This meal was spectacular. Promise me you won’t go to Positano without eating there. There’s no ordering from the menu. You are served whatever suits “Mama” on that night, and Mama is an actual person who comes out to greet her diners at the end of the meal. 2) La Taverna dei Fori Imperiali in Rome. Our guide recommended this family-owned place located just a few blocks from where our tour of Ancient Rome ended. It was crowded with locals, and the food was deliciously-prepared. Sorry. I didn’t make any pictures of this place with my camera. When you plan your trip to Rome, put it in your itinerary. You’ll be glad. 4) Taverna del Capitano in Siena. This place was recommended to us by a young man who sat near us on the train from Salerno to Florence. He was actually from Siena, and he didn’t steer us wrong. You might not be able to tell by looking at this picture, but the food was bursting with flavor. 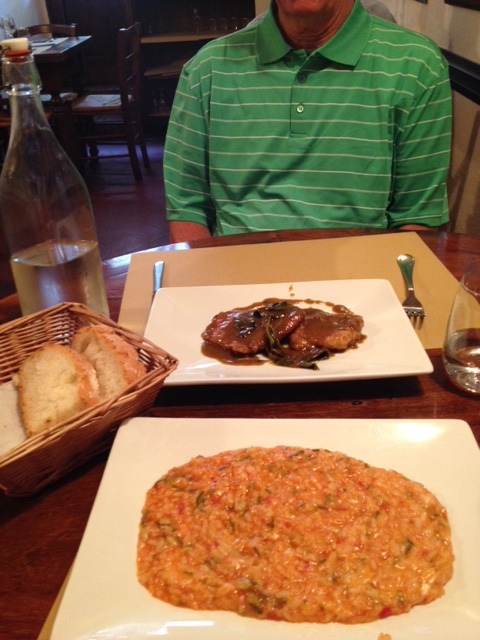 Steve ordered pork tenderloin seasoned with curry, and I had a vegetable risotto with zucchini and my new favorite cheese — scamorza. I hope I can find it in the States. 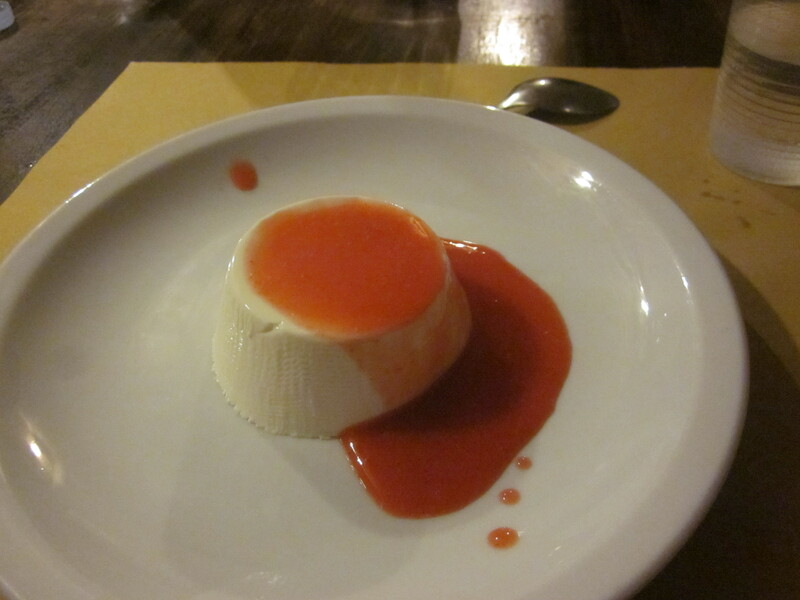 It is similar to mozzarella but with a much richer taste. We, of course, shared our entrees with each other. 5) Ristorante La Porta D’Acqua in Venice. Maybe it was because I had been soaking wet for several hours. (The one whole day we had in Venice was extremely rainy). Maybe it was because there was soft jazz playing in the background, the waiter led us to a quiet table in the corner, and the bathroom was nice and clean. I’m not sure, but I do know that the meal was peaceful, delicious and restorative. Steve had fish, and I had eggplant parmesan that was incredible. 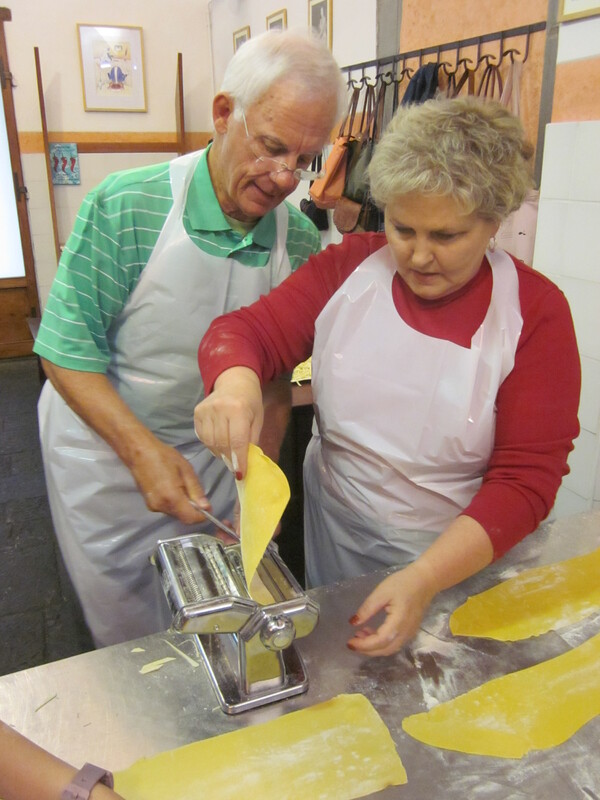 Have I convinced you yet to plan a trip to Italy?